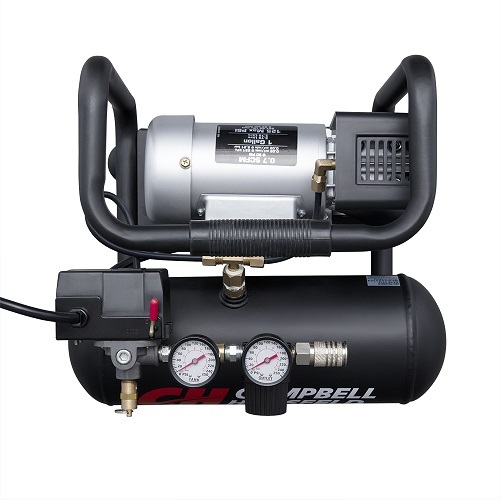 The Campbell Hausfeld 1-gallon, horizontal, oilless air compressor (CT1001) is ideal for any contractor. Ruggedly built, this air compressor is also lightweight and easy to carry. The one-gallon “hot dog” style tank is the right size for operating many pneumatic accessories, including air finish nailers, air brad nailers, air flooring nailers and air staplers — and its oilless design means no maintenance is required. Operates on 120-volt household current. 125 Max PSI, 0.7 CFM @ 90 PSI.